The pluralist society is wrong! Everyone's beliefs are not equally valid - truth is not down to who is the biggest bully! Creeds give direction, unity, and fellowship - and show the world what we believe. 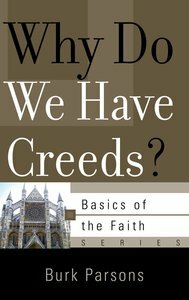 About "Why Do We Have Creeds? (Basics Of The Faith Series (Formerly 'Reformed' Borf))"
Customer Reviews For "Why Do We Have Creeds? (Basics Of The Faith Series (Formerly 'Reformed' Borf))"
Why Do We Have Creeds is one of a series of over twenty booklets on various aspects of the Christian faith. It is only a short book (42 pages) but it contains some profound statements about the nature of belief. Parsons states that our doctrine is the basis for the way we live (whether that doctrine or belief or faith is conscious or unconscious) and that we cannot be effective Christians if we try to isolate our doctrine from our intellect. Although short, this is not simplistic. The ideas are complex, as is some of the vocabulary. One point I would make - Parsons clearly beleives in the primacy of the Bible, which is classic Protestant theology. Those who do not agree with this may object to some of what this book says. Personally, I found it excellent. Thanks to P&R Publishing and NetGalley for providing a free ebook for review.